Gray iron, or gray cast iron, is named after the gray color of the fracture it forms, which is due to the presence of flake graphite. It is the oldest and most common cast iron and the most widely used cast material based on weight. It is used for housings where the stiffness of the component is more important than its tensile strength, such as internal combustion engine cylinder blocks, pump housings, valve bodies, electrical boxes, and decorative or ornamental castings. Grey cast iron’s high thermal conductivity and specific heat capacity are often exploited to make cast iron cookware and disc brake rotors. 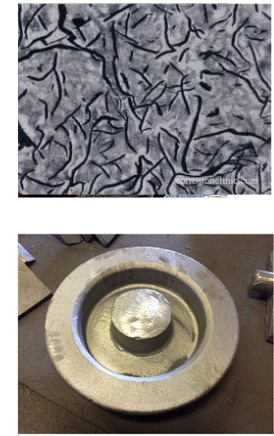 The fluidity of gray iron, along with its expansion during solidification, have made the material ideal for the economical production of castings in a variety of industries. Primarily used by architects and engineers due to its excellent machinability, vibration damping, and self-lubricating properties.